Task Manager Desktop shortcut, start minimized in Windows 8.1 / 10! A Desktop shortcut, to start the Task Manager in minimized or normal window mode, the solution is simple and for all Windows 10, 8.1, 7, ie 11! The solution here is for Windows 7, 8, 8.1 and Windows 10, the minimized mode is very useful if you want to see the CPU load in the tray area (notification area)! First you created in this example under Windows 8.1 a system desktop shortcut for the Task Manager! 1.) ... Create Task Manager Desktop shortcut! 2.) ... Task Manager and minimized start! 3.) ... Add Task Manager minimized start shortcut to Auto-Start Folder! 1.) Create Task Manager Desktop shortcut! So [Windows Logo] + [D] to see the desktop, then open the desktop menu by a right click in the blank area on the Windows desktop! Now just select New, Shortcut. In the input field, enter Taskmgr.exe. Then click the Button NEXT! Enter the name in next Window, for the example TM for task manager! And now is the desktop shortcut for the Windows Task Manager created! ... Read more: ... minimized start! (Image-1) Desktop shortcut for Task Manager! 2.) Task Manager minimizes start! But now we want to change it, so that Task Manager starts minimized, when start it via this desktop shortcut. By right-clicking on the Task Manager desktop shortcut in the menu just select Properties. And now click on the Box Run: and select Minimized, clicking Apply this will set the new start rule! (Image-2) Windows Task Manager in minimized mode! 3.) Add Task Manager minimized start shortcut to Auto-Start Folder! If you would like to add Task Manager to your own login, please use the shell:startup directory and if you want Windows Task Manager to start when Windows 10 starts, for all users shell:common startup folder. If you created the desktop shortcut for Task Manager, you can copy it directly to the Auto-Start folder. If you do not need the Task Manager desktop shortcut, just delete it afterwards. (Image-3) Add to Windows-Auto-Start the Task-Manager Minimized-Window! 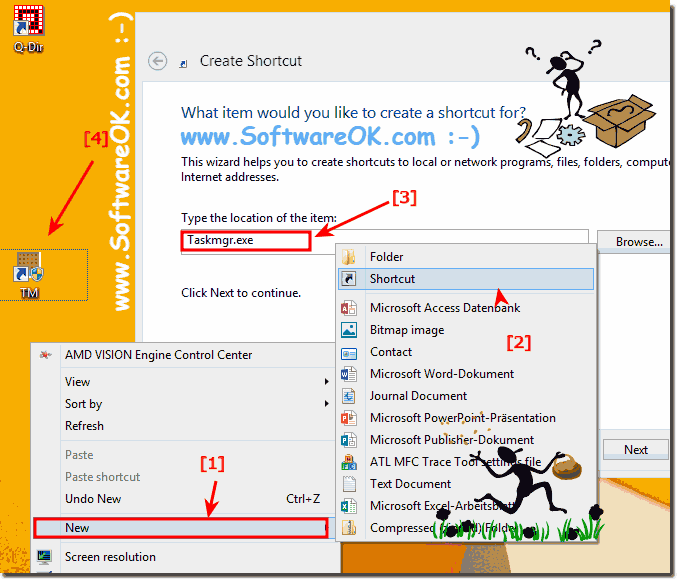 Windows-8 - FAQ-189: Task Manager Desktop shortcut, start minimized in Windows 8.1 / 10! Where is the Task Manager in Windows 8.1, 8 and 10! Start / Run Google chrome in the Metro Mode in Windows 8.1/8! Quick dock and compare the windows under Windows 8.1 / 10! Windows 8.1 / 10 How can I get back to extra large thumbnail view in ? Start task manager minimized windows 10? Windows 10 taskmanager run minimized? Start task manager minimized win 8.1? How to start the Task Manager in minimized mode on Windows? How to create a desktop icon to launch task manager? It is possible to run the Task Manager in minimized mode on Windows 8.1 or 7? Shortcut to task manager summary mode? Start task manager shortcut in mstsc?